We're told this is a viral effort from Coke. It's a video called The Mouth which shows a bunch of guys (agency creatives goofing off perhaps?) talking into their video camera phones while pointing their phone at another camera to capture it all. The video ends with a product shot of Coke and a guy drinking a bottle of Coke while filming himself doing so. Weird. But weird usually works. Pointless does too. In fact, this could easily be swapped out for a cell phone company promoting its video cam. The video, posted on YouTube March 2, now, as of March 5, has 16,000 views. Hardly network television numbers but we'll watch where it goes. With its usual wit, Axe has come out with yet another quirky promotion, this time, for its Axe Snake Gel, an exfoliating shower gel. A site called The Order of the Serpentine was developed to provide support for guys who have suffered from the "questionable hook-up." For any guy that's rolled over in the morning and wished he'd never hopped into bed in the first place, this site functions as a support group of sorts with an in-depth look at the history of questionable hook-ups and a look at the genesis of The Order of the Serpentine. As always, it's good stuff. 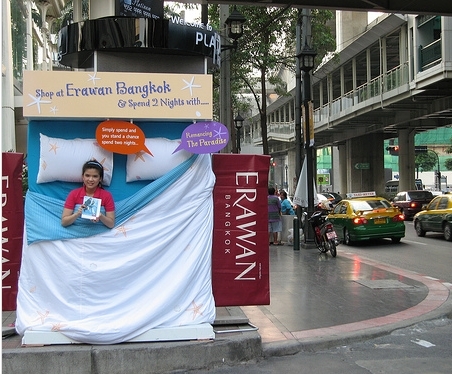 If you were a guy walking down the street and saw a girl/woman in vertical bed with the a headline over her that read, "Shop at Erawan Bangkok and spend two nights with...," what would you do? What would you think? Would you walk over and ask if you could crawl into the bed for a nooner or would you ask if her boyfriend had just kicked her out? Would you ask her if there was some new public sleeping trend you were missing out on? Girl in Bed Would you wonder why she had that headline over her head and was passing out fliers? 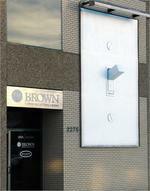 Would you ask her how long the crazy ad agency that came up with this asked her to stand there as man-bait? Or, while we seem to doubt it, would you just walk buy and ignore it like you do with all other advertising? Here's a simple but powerful message from the folks over at the agency whose name sounds like an 80's highschool jiggle-fest movie, Wexley School for Girls. 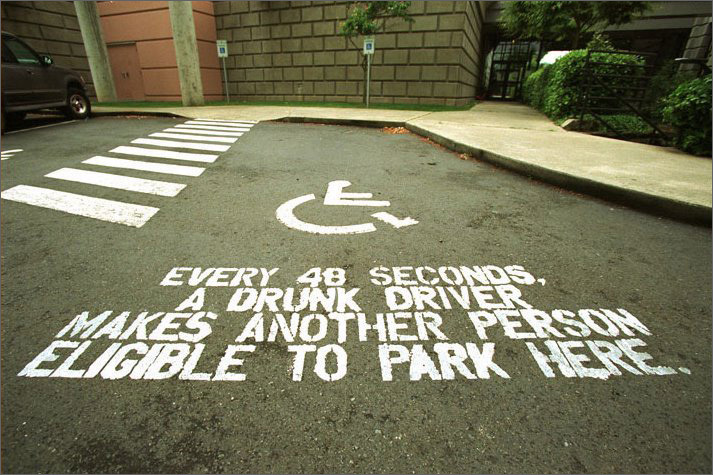 The message was applied to handicap parking spots at schools prior to a prom. 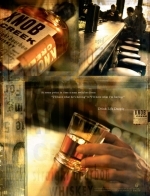 Knob Creek has launched a new print campaign, its first since 2001, for the distiller's super-premium bourbon. Three ads were created by energy BBDO and will appear in men's magazines including Esquire, Fast Company, Men's Journal, Spin, Wired and The New Yorker. With the tagline, "Drink Life Deeply" and collage imagery that features the bottle, the campaign wallows in the self importance a high end brand is supposed to instill among its audience. Fully embracing the notion and value of consumer generated content, MasterCard, during the Oscars, will air two commercial which say basically nothing. The ads, Sailboat and Typewriter, will follow the customary format of listing prices for various items and closing with the final item labeled "priceless." 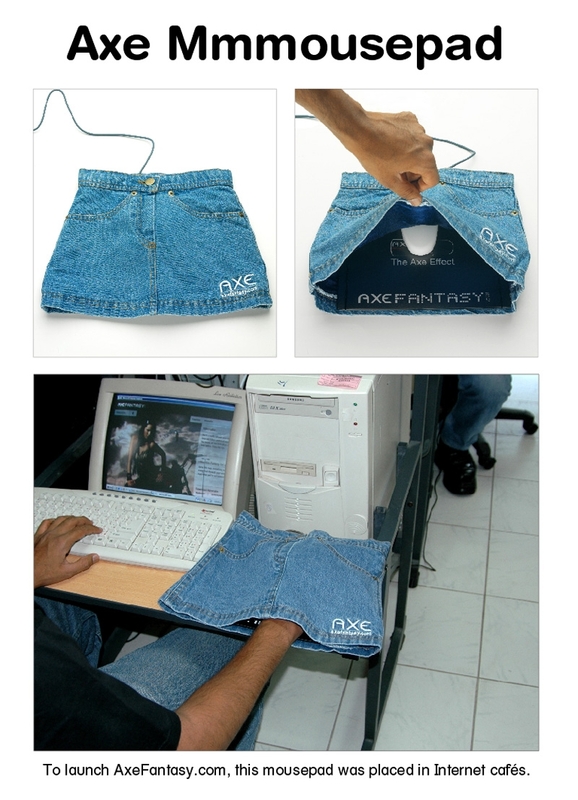 However, the item lines in these ads will be left blank. The ads will close encouraging people to go to priceless.com, click on "Write a Priceless Ad Contest" and complete the commercial by filling in the blanks using their own words.